Interested in growing Marijuana? Not sure if it’s easy and safe? Can I cook with it? Worried about legality? Then read this book and learn step by step how easy it is to order, grow, harvest and cook with Marijuana discreetly and how to benefit from its wellbeing properties. It describes cannabis cultivation, cloning and consumption – edibles, tinctures, vaping and juicing as well as making hash. Feeling the effects of ageing? Becoming more lethargic? Need a safe pick-me-up or relaxant? Look no further; learn how to reduce the ageing effect by growing Marijuana and making your favorite Cannabis comfort food and medicine. Enjoy growing herbs and vegetables? Find out how easy it is to grow low cost, quality Marijuana. It’s easy to grow Marijuana in pots for both inside and outside at a low cost. ‘Growing Marijuana Step by Step Guide’ is for those that enjoy growing and cooking. You don’t need any skills in growing cannabis; it’s called a weed for a reason. No green thumb or special tools required! 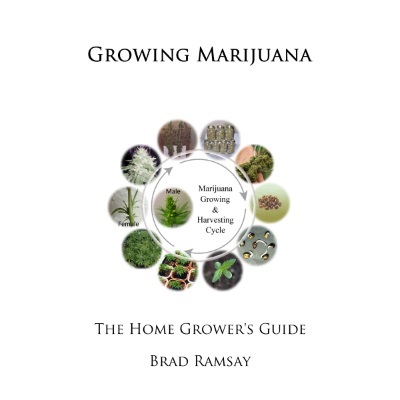 Growing Marijuana: The Home Grower's Guide A step by step guide for growing, storing and consuming Marijuana Interested in growing Marijuana? Not sure if it's easy and safe? Can I cook with it? Worried about legality? Then read this book and learn step by step how easy it is to order, grow, harvest and cook with Marijuana discreetly and how to benefit from its wellbeing properties. It describes cannabis cultivation, cloning and consumption - edibles, tinctures, vaping and juicing as well as making hash. Feeling the effects of ageing? Becoming more lethargic? Need a safe pick-me-up or relaxant? Look no further; learn how to reduce the ageing effect by growing Marijuana and making your favorite Cannabis comfort food and medicine. Enjoy growing herbs and vegetables? Find out how easy it is to grow low cost, quality Marijuana. It's easy to grow Marijuana in pots for both inside and outside at a low cost. 'Growing Marijuana Step by Step Guide' is for those that enjoy growing and cooking. You don't need any skills in growing cannabis; it's called a weed for a reason. No green thumb or special tools required! Grow Marijuana Calendar – When and how to grow with a recipe book for your favorite snacks, drinks and smoking made from Marijuana. Grow Marijuana Calendar Learn how to grow Marijuana for smoking, eating and drinking. Try some of these favorite recipes here. This easy growing approach to growing Marijuana shows you all the steps you need to know to grow Marijuana successfully. It is fully illustrative with images of each stage of marijuana growth. This easy growing Marijuana calendar dovetails nicely with Grow Marijuana Weed Indoors and Outdoors by the same author Brad Ramsay.